You'll be £12.99 closer to your next £10.00 credit when you purchase Panzer Destroyer. What's this? The day after Vasiliy Krysov finished school, on 22 June 1941, Germany attacked the Soviet Union and provoked a war of unparalleled extent and cruelty. For the next three years, as a tank commander, Krysov fought against the German panzers in some of the most intense and destructive armoured engagements in history including those at Stalingrad, Kursk and Knigsberg. This is the remarkable story of his war. As the commander of a heavy tank, a self-propelled gun - a tank destroyer - and a T-34, he fought his way westward across Russia, the Ukraine and Poland against a skilful and determined enemy which had previously never known defeat. The ruthlessness of this long and bitter campaign is vividly depicted in his narrative, as is the enormous scale and complexity of the fighting. Honestly, and with an extraordinary clarity of recall, he describes confrontations with German Tiger and Panther tanks and deadly anti-tank guns. He was wounded four times, his crewmen and his commanding officers were killed, but he was fated to survive and record his experience of combat. His memoirs give a compelling insight into the reality of tank warfare on the Eastern Front. From the point of view of historians in the west, one benefit of the collapse of the Soviet regime has been a steady stream of translated memoirs from front-line Soviet soldiers, who now can tell their stories without having to toe the communist party line. 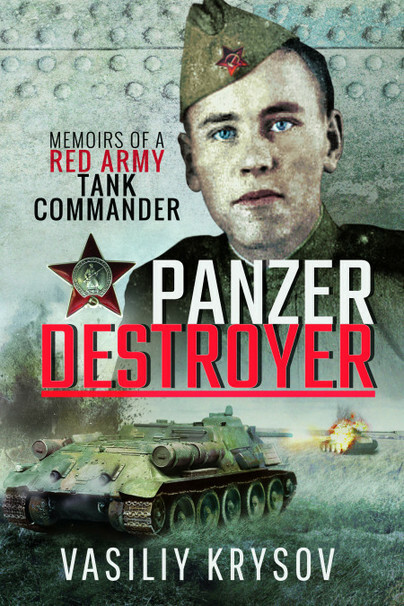 In this recent addition to the genre, Vasiliy Krysov gives us a worms-eye view of life as a Red Army tank and self-propelled gun commander, starting at Stalingrad in 1942, and completing his odyssey in 1945 on the shores of the Baltic. Thrice badly wounded, he took part in numerous battles, and by weaving together his own recollections, those of his comrades, and the results of his research in the Russian MOD Central Archives, he has produced a vivid, crisp and informative narrative. In particular it provides a valuable insight into how the Russians used their armoured forces, and particularly self-propelled guns, to support infantry division attacks. Free from the post-war stricture of Soviet orthodoxy, the author is able to take a reasonably objective approach when discussing his experiences. He readily acknowledges the skill and steadfastness of his opponents where appropriate, and does not avoid the less palatable features of life in the Red Army, such as the often disgraceful treatment of women soldiers, the callousness of some senior commanders, and the bias towards party members when it cam to awarding combat medals and promotion. In order to set the battles in a wider context, the English editor has added some very useful footnote information on the German opponents against whom Krysov fought, and the text is also supported by six reasonable maps and a score of relevant photographs. There are a few minor errors with dates, but these do not detract from what is a well researched and readable memoir of a man who served his country well, and a fitting tribute to the comrades who fought - and often died - alongside him. Thoroughly recommended. Krysov's memoirs play a valuable role in presenting a balanced picture of life within the Red Army, countering both the very hostile attitude found in many German memoirs (in which the Red Army is portrayed as fighting through fear of its own officers and with little or no skill), and the formulaic approach of many Soviet era memories. What emerges here is a picture of a more complex army, in which most soldiers were motivated to keep fighting by the bonds they had formed with their immediate comrades (the same picture emerges from German, American and British memoirs). The role of the Communist Party is also more complex than is often portrayed, with the political officers emerging as a rather mixed group, some bad, some very impressive. This book tells the story of Vasiliy Krysov, a commander of a variety of tanks and SPG's during World War Two. He spent his time as commander fighting his way westward across Russia, the Ukraine and Poland against a skillful and determined enemy. The ruthlessness of this long and bitterly fought campaign is vividly depicted in the personal account of the time. During the fighting Vasiliy was wounded four times, his crewman and his commanding officers were killed, but he was fated to survive and document his experience of combat. At the war's end Krysov stayed on in the Red Army and in 1958 he graduated with honours from the Academy of Armoured Mechanized Forces, but retired soon after due to ill health. He now lives in Kirov as a pensioner, but this book describes a remarkable period in his life that brings home the terrible fighting and hardships endured during that time. Vasiliy Krysov took part in, and survived, some of the great tank battles of WW2, including Stalingrad and Kursk. His war started as a Lieutenant commanding a KV-1S main battle tank, followed by command of various self-propelled guns, and ended up with company command in a T34 regiment. Krysov is one of a very few remaining veterans of the Red Army's advance through Russia, Ukraine, Poland, and into Germany: As such his book merits attention. And better still, he was never a member of the Communist Party so his account is refreshingly free from politics and dogma. Some of the prose betrays the fact that the book is translated from Russian into English. And a few Americanisms have crept in, uch as the use of the word 'tankers' instead of 'tankies'. But overall it reads well. Panzer Destroyer contains enough to engage anyone with a general interest in the Second World War. But, if you like tanks - you'll love this book. Vasiliy Kryson fought on the Eastern Front as a tanker throughout the Second World War. After the war, he wrote one of the outstanding first-hand accounts of tank warfare in the Red Army.